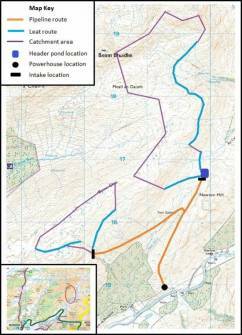 The Merk Hydro Scheme is an excellent example of the design capability of CRF Hydro Power. The scheme has a relatively small catchment area which it will make very effective use of through the creative use of leats and secondary intakes, combined with the establishment of a small header pond. The diversion of all of the water into the small header pond allows the scheme to release the water for generation at a time of our choosing. The header pond is planned to have storage for approximately 3 hours and 50 minutes of generation at design power output. There will be two pipelines. The main penstock routes directly from the header pond to the powerhouse which is designed to carry the high water pressure resulting from the high altitude of the header pond. The secondary pipeline will route water from the secondary intake to the header pond during periods not generating and to the powerhouse during periods of generating. A stone built powerhouse will be located at the base of the hill in a hollow near the River Fyne with the tailrace returning all water into the River Fyne. Planning consent from Argyll & Bute Council and a CAR Licence from SEPA was granted for the scheme in 2011. 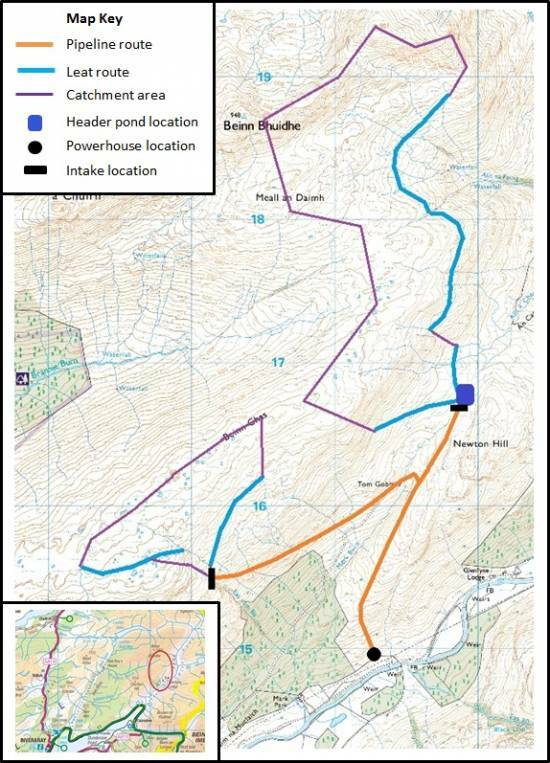 A Grid connection has also been secured from SSE and construction has now commenced. It is anticipated that the scheme will be operational by Autumn 2014. If you wish any further information about the Merk Hydro Project, you can contact us at info@merkhydro.com.